Keep your kids as healthy as possible! You probably love the social interaction your children get at the various activities you allow them to attend, but the preschool germs they pick up can be quite annoying when the germs result in an illness. You can expect to encounter a certain amount of germs everywhere you go - preschool, the grocery store, the park - but there are certain precautions you can take to make sure your children don't wind up sick every time you go out. Kids are notorious for grabbing and touching things that adults probably wouldn't find interesting. 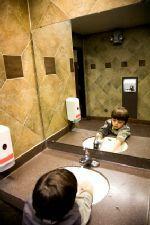 When was the last time you felt the irresistible compulsion to investigate the floor in a public restroom? Kids learn about the world around them by touching everything, and although this can be great for their cognitive development, it exposes them to plenty of preschool germs. When you consider the fact that many of these people didn't bother to wash their hands after handling the germy item and before opening the library door, you can understand how something as simple as a door handle can harbor a veritable smorgasbord of preschool germs. All it takes is for you to grab the handle, and you suddenly have the germs on the palm of your hand. The same principle of the germy door handle applies to just about everything you can find in the room of a preschool. Kids are constantly wiping their noses, coughing on their hands, and sneezing with great exuberance all over the items around them. Kids may also not have the art of hand washing down perfectly, so even if they wash their hands after using the potty they may still have germs on their hands which spread to the toys they pick up after visiting the restroom. Kids in preschool also commonly like to hug, wrestle, and hold hands, so even if your children don't pick up germs from the toys at preschool then they may inherit germs directly from their friends. Although preschool teachers and other staff members usually make a concerted effort to keep the toys clean and the preschool equipment sanitized, there will always be germs present. Make sure the preschool your children attend has a strict policy which does not allow sick children to attend and which also has a regular schedule for the cleaning and sanitizing of the items within the room. Although you can expect to encounter germs in every preschool setting, if you approach a play area and witness several children playing who are obviously sick (coughing, sneezing, running noses) then it may be best to find a different place to play. Unless your child has a compromised immune system, there is no reason to be exceedingly fearful of preschool germs. It's normal for every kid to come across a host of germs throughout the day, and most kids encounter these germs without incident. An occasional cold isn't unusual, and you simply cannot shelter your children from every single germ out there. Carry hand sanitizer with your for those times when you can't get your kids to a sink, but don't raise your children with a debilitating fear of the germs in the world around them.